Casa Padrino, the renowned retailer of rustic garden tools, offers you a beautiful selection of rustic garden swings made of oak. All garden swings from our collection have been lovingly made by hand and are made of the best solid oak wood. 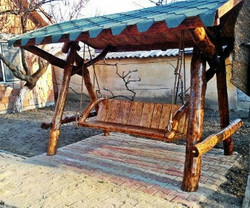 In addition, all garden swings are absolute eye catchers! Since each garden swing from our collection is unique and each tree trunk has a different structure, there may be minor deviations from the picture. Casa Padrino offers you a variety of garden swings to choose from. 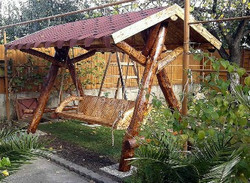 Whether furniture in the baroque style or in antique style, with us you are guaranteed to find the right one for your garden ideas. Just browse through our wide selection and find exactly the right one for your needs. Enchant your garden area in a stately oasis of modern home decor. Our exclusive accessories can be easily combined with other pieces of furniture to suit every style of furniture. We at Casa Padrino also offer you an uncomplicated and Europe-wide delivery at reasonable and fair prices. Idealism and passion are very important at Casa Padrino. If you have questions or special requests regarding our offers, please call us on the hotline + 49-201-36577485 and our qualified support will help you in every detail! Casa Padrino, your baroque wholesaler on the internet and on site. Just magical.